If your house has a little ghost problem and you don’t want to move, you have a couple options at your disposal. You can try to exorcise those pesky specters, or you could just try to live with them and hope it evolves into a quirky sitcom story and you get some cool new ghost roommates (which sounds super awesome, but also unlikely, for too many reasons to go into right now). On the other side of the coin, if you are a ghost with an annoying pre-deceased human problem that all your dedicated haunting can’t seem to take care of, you need to call the afterlife’s premier bio-exorcist himself: Beetlejuice! You’re not going to find his services listed in the "Handbook for the Recently Deceased", and he may be a bit shady and rough around the edges (he’s been dead for a long time, after all), but we promise this guy is legit and will get the still-living out of your home so you can get back to enjoying your afterlife in peace. Luckily, now you don’t have to be a ghost to scare the pants off the living! 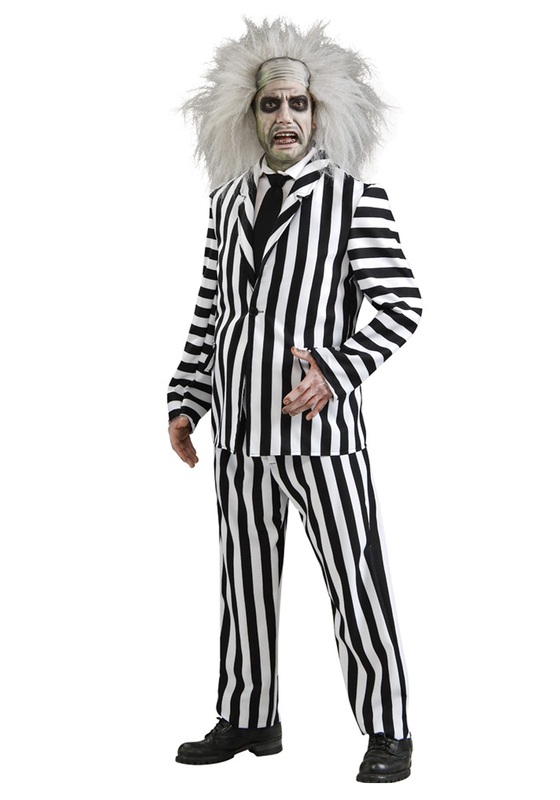 With this Deluxe Beetlejuice Costume, you can try out your haunting skills while looking like the “ghost with the most” himself. 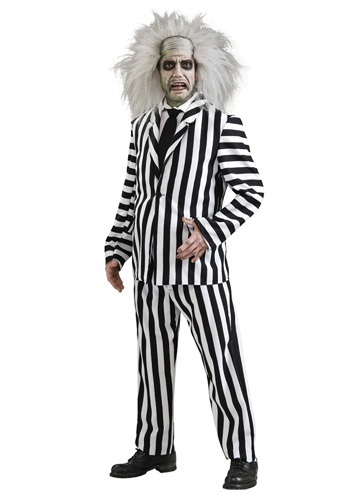 This officially licensed costume recreates the look of his classic striped suit jacket and pants he wears when he's performing his devious trade (when he’s not in the shape of a giant snake, that is), with pocket flaps and a white dress shirt and black tie dickey to complete the suit. Wear this suit on its own for a classy supernatural fashion statement, or slap on some ghoulish makeup and a wig to look just like Beetleju--- oops, that was a close one, we almost said it three times!